The steadicams building tutorials are among the more popular builds on the blog. No wonder, as using a Steadicam produces significantly smoother video than just holding a camera by hand. Chad Bredahl over at krotoflik has a new tutorial (and his tutorials are top notch – see his Jib and Travel Jib tutorials). 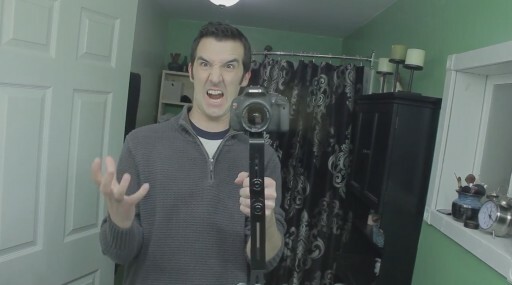 This time it’s a $30 steadicam based around a half shaft and some double flash brackets. (A full fledged system is about $799 if you were wondering). For a build tutorial a demonstration short and some musing from me hit the jump. It’s not really a problem to design a piece of gear. Actually it is quite easy. It is extremely hard to design a good piece of gear. And the only way to know that it’s good is using it. It’s called eating your own dog crap. Well, Chad is certainly eating his own crap (in the nicest way) and executes a short for each of the builds that he makes making sure that they work nicely. The other reason is that Chad’s tutorials are so nice, is because the gear look nice. It is not only functional. Chad usually finds the right mix of ingredients that not only makes his build work, but also that it would not be embarrassing to show up on set using them. Before the build tutorial goes on, check out Chad’s Splintered Past a splinter cell inspired short done using the steadicam. Actually you can easily mod a Steadicam Smoothee (you can get them for under $100) with a MUCH better gimbal and build, and it will work with DSLR’s. Costs a bit more, but works better (micro adjustable too).